Last December 17th I did a post called “Subtleties of fall.” The following day was still fall, and after getting up and seeing some fog, which isn’t common here, I decided to go out and take photographic advantage of its subtleties. My first stop came just half a mile from home along the dip on Floral Park Dr. from which I could look into the southern part of Great Hills Park with a telephoto lens. Then I went on to Riata Trace Pond. 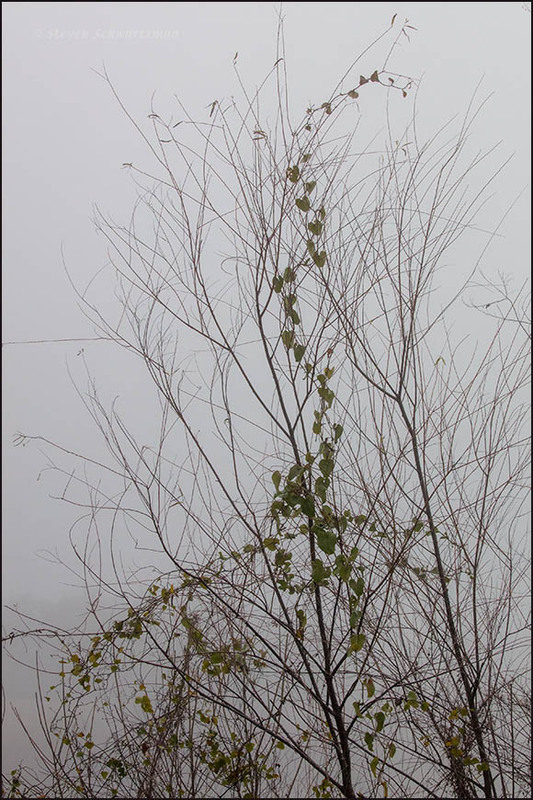 One of my favorite foggy finds there was a greenbrier vine (Smilax bona-nox) that had climbed high on a black willow tree (Salix nigra) whose now-fallen leaves revealed what they had so recently concealed. Fogs are so appealing, mysterious yet lovely at the same time. And they afford us separation in what otherwise might be chaotic compositions. Yes, mysterious and lovely, and afforders of separation. I appealed to this morning to bring me more; instead it provided the clearest and brightest view of Venus in a long time; Jupiter was there too. Was there a grey horse in the distance drinking from the pond? Horse? Is there a horse in that picture? Now that you mention it, maybe not. Oh well…. Ew! Smilax bona-nox is an odd vine. I rather disliked it when I found it on a chain link fence in Oklahoma. I disliked it so much that I got seed to take back with me. It took me a while to figure out what it is. The name fits it, and also sounds like the name of a character of a Doctor Seuss book. Did you happen to see my Windows Of Heaven post? It is not exactly horticulturally oriented, but I liked the picture. It’s among the most common vines here. The thorns have had their share of me at times but I still like the plant photographically. You were fortunate in your photo to get that shaft of light. Yes, it was not planned. I just happened to be there getting a picture of something else. 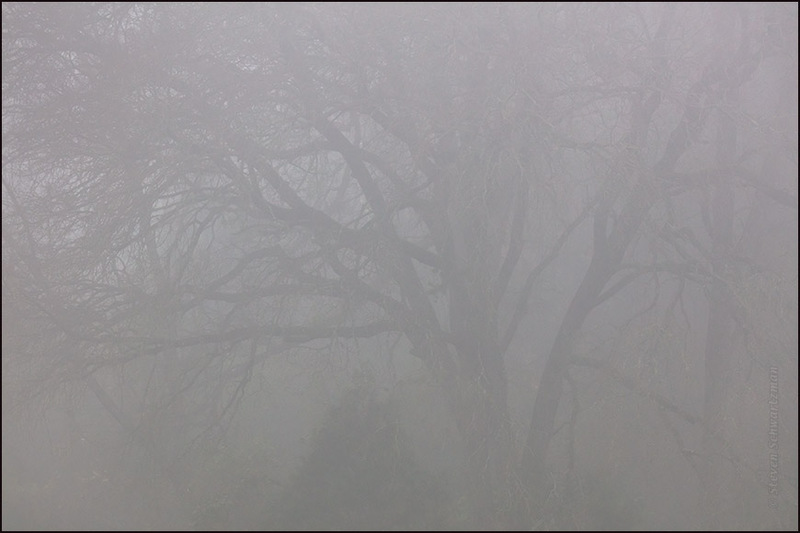 Fog can be a beautiful thing, softening everything around it. It is common up here at this time of year. Dawn colors can be quite beautiful through a light fog. As common as fog can be along the Pacific coast and where you are, that’s how uncommon it usually is here, so when the chance presents itself, I go for it. Very Nice Steve! It is fun to photograph in the fog! 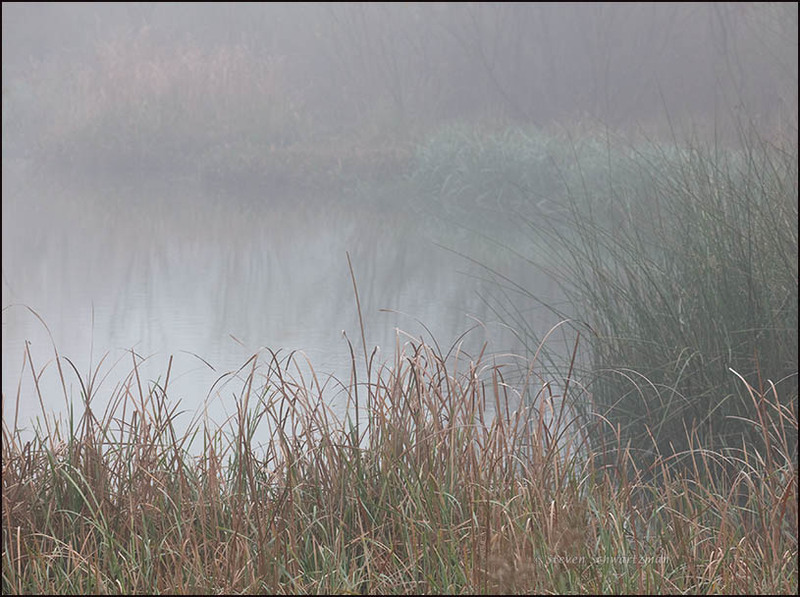 Most people do not think of photographing in the fog. But that would be their loss! I think about it often enough, it’s just that my area doesn’t favor it. The more, the better, as far as I’m concerned. Fog is wonderful. I think it really highlighted your vine in the last picture. Or eliminated any distraction. Are the leaves near the top heart-shaped? We just had a sunset lighting up the misty fog. The aftermath of quite the wild storm that just roared through here, bringing some much needed rain and high, gusty winds. Fun! Now that’s something I don’t remember ever seeing here: fog at sunset. Fog seems to be strictly a morning phenomenon here. I especially like the clambering vine in the last photo. Greenbrier does have staying power; my impression is that it lasts far longer than other vines. The red and yellow vines that decorated my Ashe juniper ‘Christmas tree’ are gone now, and there seems not a bit of evidence they ever were there. Andrew Wyeth spoke of winter as the season when the “bone structure of the landscape” makes itself visible. I’d say the willow and vine do that, beautifully. Going by the third photo, I could have called this post “Varieties of greenbrier experience.” After two decades of portraying the common plant species here, I’m always happy when I find a new way to do it. This time fog was the new element. You mentioned greenbrier lasting. One form in which it does so in central Texas is as a large tangle of dead, leafless vines. While the strands are too long and thin and zig-zaggy to pass as bones, at least in my limited imagination, they do play a similar role in winter. Andrew Wyeth’s description makes me think of the dried-out Ashe juniper branches that are a common sight here. You see why I went out that morning.